S Sahu, A Gupta, P Sachan, D Bahl. 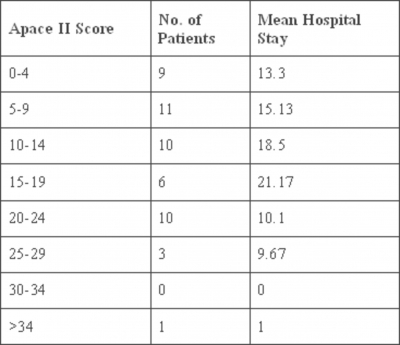 Outcome Of Secondary Peritonitis Based On Apache II Score. The Internet Journal of Surgery. 2007 Volume 14 Number 2. Secondary peritonitis follows an intraperitoneal source usually from perforation of a hollow viscus. Despite advances in diagnosis, surgical technique, antimicrobial therapy and intensive care support, secondary peritonitis remains a potentially fatal affliction. Several scoring systems were developed to evaluate and compare the outcome of treatment. Aim: The aim of the study was to compare the outcomes of secondary peritonitis using APACHE II score. 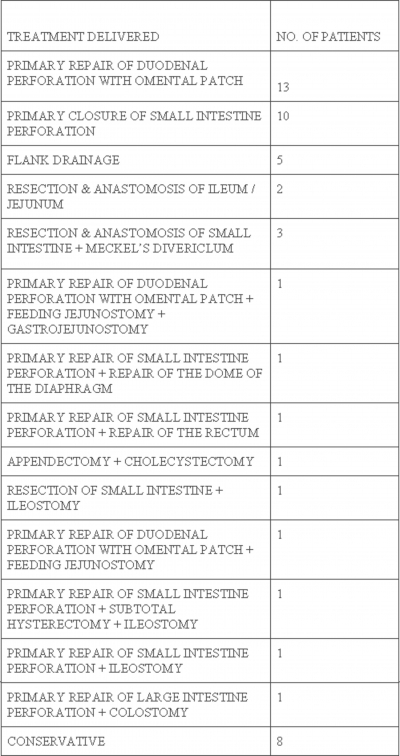 Material And Method: This prospective study was conducted for a period of 12 months on 50 patients admitted as cases of secondary peritonitis in the Department of Surgery, Himalayan Institute of Medical Sciences, Dehradun; India. The acute physiological parameters of APACHE II score were assessed and recorded at the time of admission. 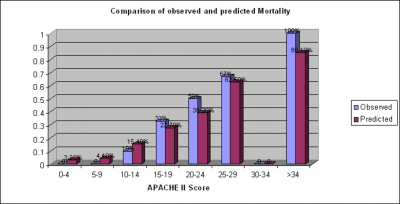 Postoperative outcomes were assessed and compared with the APACHE II scores. Result: Patients who had a score between 0-9 had the most favorable prognosis and worst prognosis was seen with scores above 20. The lowest mortality was seen in patients with scores less than 20. Conclusion: APACHE II score, as measured before the treatment of secondary peritonitis, correlates significantly with the outcome of the disease with respect to both morbidity and mortality. The aim of the study was to compare the outcomes of secondary peritonitis using APACHE II score. 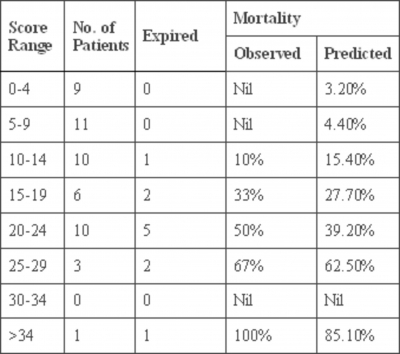 This prospective study was conducted for a period of 12 months on 50 patients admitted as cases of secondary peritonitis in the Department of Surgery, Himalayan Institute of Medical Sciences, Dehradun, which is a major tertiary health care center in the state of Uttarakhand, India. All the patients clinically diagnosed as secondary peritonitis including abdominal trauma and patients of both sexes and all age groups irrespective of the duration of illness and etiology were included in the study. Clinical evaluation as well as hematological, biochemical and radiological investigations were carried out to confirm the diagnosis. Chronic Health Points (CHP) were added if the patient had a history of severe organ system insufficiency or was immunocompromised: 2 for elective post-operative patients; 5 for non-operative or emergency post-operative patients. 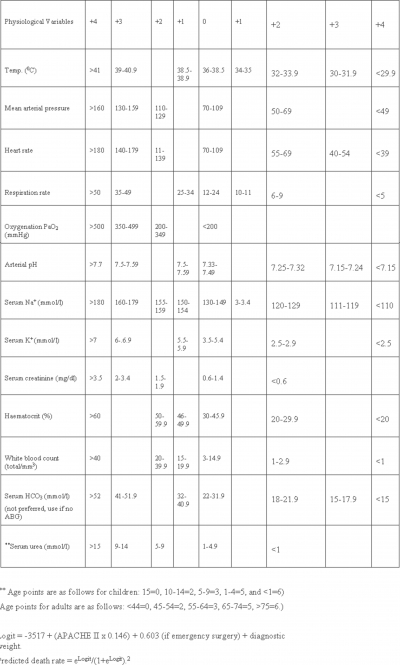 The Glasgow coma score (GCS) ranging from 3-15 was also assessed in the study. Patients were resuscitated with intravenous fluids along with correction of electrolyte imbalances. Broad-spectrum antibiotics cover was given to all the patients. All patients who were fit to withstand general anesthesia were subjected to exploratory laparotomy to evacuate the purulent material from the abdomen and to stop the source of infection. Bilateral flank drainage or conservative management was done to those who were unfit for surgery. 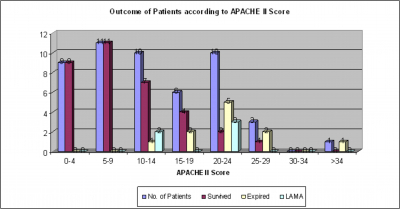 Postoperative outcomes were assessed and compared with the APACHE II scores. The age of the patients ranged from 6-82 years with a mean of 38.12 years. The commonest presenting symptom was abdominal pain (100%), followed by distension of the abdomen (82%), constipation, vomiting and fever. The patients who had a score between 0-9 had the most favorable prognosis and worst prognosis was seen with scores above 20. The lowest mortality was seen in patients with scores less than 20. (TABLE-6) (FIG-2). APACHE II parameters have shown a stronger relationship to the outcome than previous groupings by anatomical criteria, cause, abnormality, age and chronic ill health. APACHE II score, as measured before the treatment of secondary peritonitis, correlates significantly with the outcome of the disease with respect to both morbidity and mortality. 1. Knaus WA, Zimmerman JE, Wagner DP, Draper EA, Lawrence DE. APACHE - acute physiology and chronic health evaluation: a physiological based classification system. Crit Care Med. 1981; 9:591-7. 2. Knaus WA, Draper EA, Wagner DP, Zimmerman JE. APACHE II - acute physiology and chronic health evaluation: a severity of disease classification system. Crit Care Med. 1985; 13:818-29. 3. Adhesunkanmi ARK, Badmus TA, Agbakwuru EA, Ogunronbi AB. Acute generalized peritonitis in adult African patients: assessment of severity using APACHE II score. Annals of the College of Surgeons of Hong Kong. 2003; 7:23-28. 4. Bohnen JM, Mustard RA, Oxholm SE, Schouten BD. 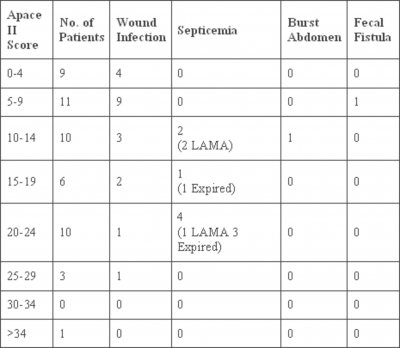 APACHE II score and abdominal sepsis. A prospective study. Arch Surg. 1988; 123:225-9. 5. 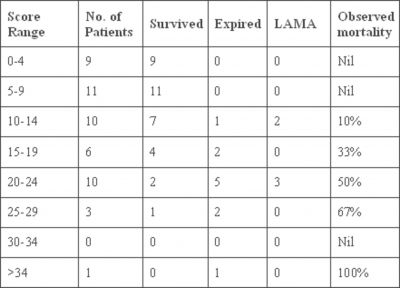 Komatsu S, Shimomatsuya T, Nakajima M, Amaya H, Kobuchi T, Shiraishi S, Konishi S, Ono S, Maruhashi K. Prognostic factors and scoring system for survival in colonic perforation. Hepatogastroenterology. 2005; 52:761-4. 6. Adhesunkanmi ARK, Oseni SA, Adejuyigbe O, Agbakwuru EA. Acute generalized peritonitis in African children: assessment of severity of illness using modified APACHE II score. ANZ J Surg. 2003; 73:275-9. 7. Agarwal S, Sharma D, Raina VK. Arterial pH and arterial oxygention are not essential for risk stratification in perforation peritonitis. Indian J Gastroenterol. 1999; 18:5-6. 8. Koperna T, Semmler D, Marian F. Risk stratification in emergency surgical patients: is the APACHE II score a reliable marker of physiological impairment? Arch Surg. 2001; 136:55-9. 9. Adhesunkanmi ARK, Badmus TA, Fadiora FO, Agbakwuru EA. 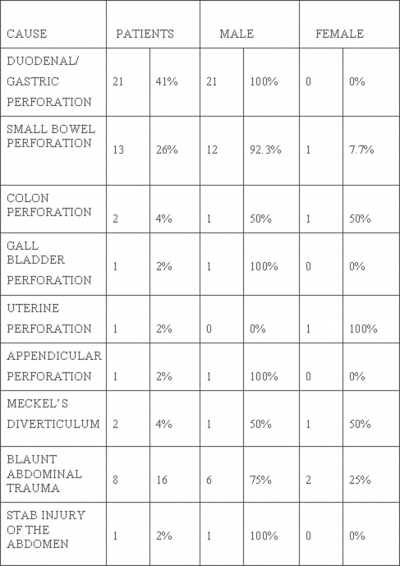 Generalized peritonitis secondary to typhoid ileal perforation: Assessment of severity using modified APACHE II score. Indian J Surg. 2005; 67:29-33.